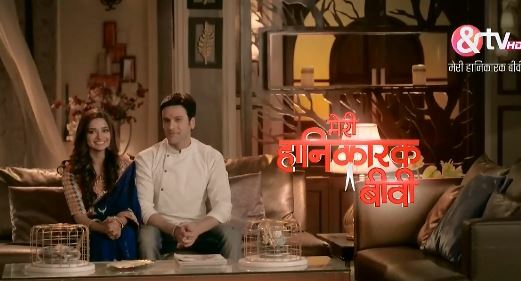 The Episode starts with Ira asking Mishri to come with her. Mishri cries and apologizes to her. She says let me stay here for some days. Ira refuses. Mishri says give me a chance to fulfill Pushpa’s wish. Ira says yes, but you won’t create any rift between Akhilesh and Kunika, you won’t go in front of him, promise me. Mishri promises. Ira says fine, you can stay here for some days. Mishri hugs her happily. Devina calls kunika and asks why did you do, you should have made a sad face. Kunika says no, this happened because of Vansh. Devina says I didn’t know you are duffer, Monu is behind this. Kunika says we have to find some solution of Monu. Devina asks her to chill. Ira says Mishri didn’t do right, Kunika is a nice girl, I don’t want Akhilesh and Kunika to have any problem because of kids. She goes to Akhilesh’s room. She sees Akhilesh coming. Akhilesh has foam on his face. He looks for towel. Ira helps him. He asks about her wound. She says its nothing. He asks her to sit. He does the aid to her. Roke na ruke naina….plays… Ira cries and thinks of their old time. He asks her to take care. She goes. He goes to sleep.